As Liberia enters its second week with no new cases of Ebola, the Embassy of Cuba in Monrovia officially announced during a farewell ceremony the end of the mission of a medical team sent by the authorities of the island to the West African country ravaged by virus. The Cuban team was composed of 53 health workers among epidemiologists, intensive care physicians, general practitioners, surgeons, pediatricians, nurses and intensive care nurses, anesthetists and nursing graduates. Before traveling to Liberia, the team underwent a basic initial training on Ebola at the Institute of Tropical Medicine in Havana, which was supplemented after his arrival in Africa with a second training to work safely in a treatment unit Ebola built by US military in the grounds of the former Defense Ministry compound in Monrovia. The Cubans treated 198 people admitted since 6 November 2014. Of these, 54 were confirmed cases. The last positive case of Ebola treated by the team of the island was discharged on February 10. While in Liberia, the Cuban medical brigade operated under the banner of the World Health Organization, sharing duties with company personnel and Liberia, the Centers for Disease Control and Disease Prevention United States, the African Union and Sweden . No member of the Cuban mission in Liberia contracted the virus, although in Sierra Leone, where Dr. Felix Baez Sarria infected. Baez was successfully treated in Switzerland and recovered from the disease. Two other Cuban aid victims died of malaria. 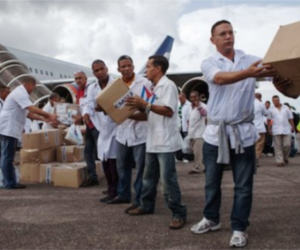 The deployment of a Cuban medical contingent in Liberia, Sierra Leone and Guinea-Conakry came from a commitment of the Government of Cuba to the UN secretary general, Ban Ki-moon, and the director general of the World Health Organization, Dr. . Margret Chan. A cooperating enrollees were warned that they could not return to Cuba in case of acquiring the virus, unless heal.